Deliciously easy football finger food or party appetizer! 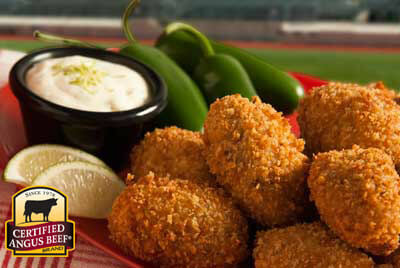 Jalapeño Beef Poppers are crispy on the outside and filled with ground chuck, cheddar cheese, and fresh jalapeños. 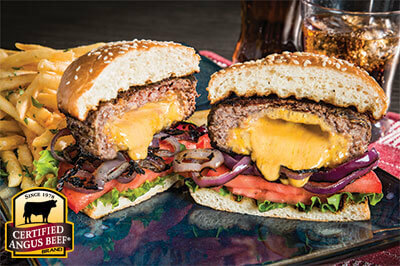 Combine ground beef, cheese, jalapeños, salt, pepper and mustard seeds in a large mixing bowl. Portion by hand into 42 “popper” shape balls, approximately 1-ounce each. Crack and whisk eggs; put in a shallow dish. Combine bread crumbs and put in a second shallow dish. Prepare a pot with frying oil; heat to 325° F. Roll poppers in egg mix, 6-8 at a time, roll in bread crumbs; repeat. Deep fry 4 minutes in batches. Allow to dry on paper towels; serve warm with Honey Lime Crème Fraiche for dipping.